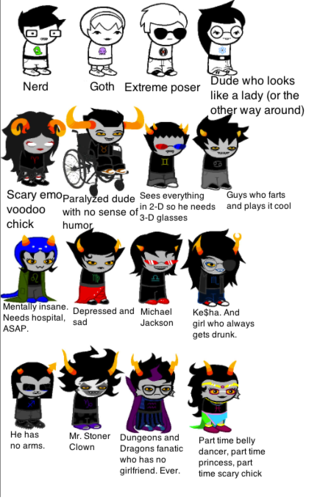 Homestuck According To My Friend. .______.. Wallpaper and background images in the Homestuck club tagged: homestuck according to. @TheDarkEmpire : THAT WAS MEAN !!!!! anyway Eridan can have a girl-friend when-ever he wants one ! joke JOKE ? i never take jokes i never ! so if you ever EVER tell a joke like that again i am sure you will find yourself sleeping with the fishes ! The closest thing to a girlfriend Eridan has ever had was Feferi and she dumped him. After that, it was one heartbreak after another. He hit on Vriska, Kanaya, Jade, Nepeta, Karkat, Rose, and Sollux, they all rejected him. P.S. Harry Potter clones are a dime a dozen. Even if Eridan is the best of these imposters, he's still nowhere near as cool as the real Harry Potter. It is a joke. Jokes can ignore facts. It's part of what makes them jokes. I pay attention to canon, and what you said, I GET IT. I already know all that. Yes, those facts are true. 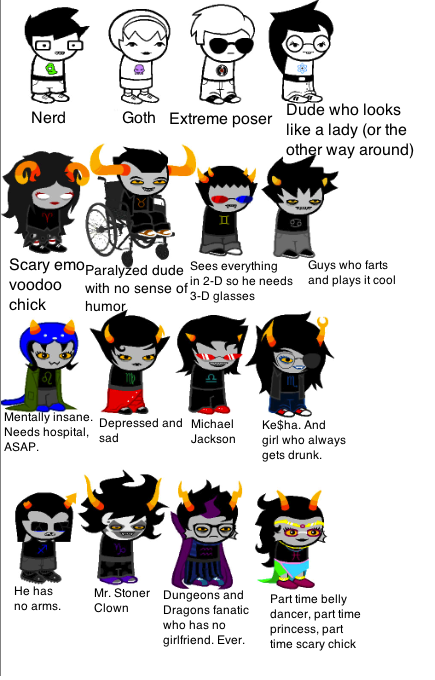 The "forever alone Eridan" thing is just a widespread joke the fandom has for shits and giggles, it's not because we don't like him because we do, but because it's just for joking purposes. We realize it isn't actually true and that he's not actually unable to have any friends or relationships. If you don't find it funny, that's fine, but there's absolutely no need to get so worked up over it. And what does Harry Potter have to do with this I never said anything about that. *I'm just gonna ignore the brewing battle overhead. Well, not really because it took place 10 months ago. * This is hilarious, I love these!